Tessa Longbons | April 3, 2018. Iowa’s 2016 vital statistics report, which includes seven pages of information on abortions performed in the state, was released on schedule this past December. 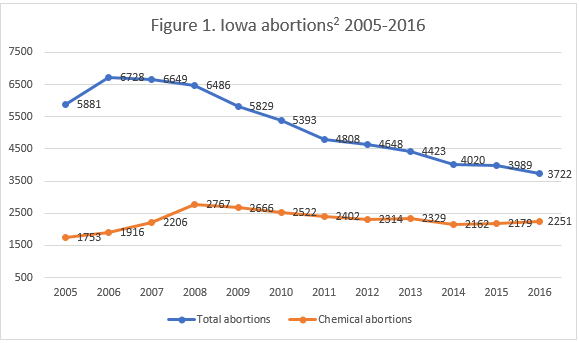 Published by the Iowa Department of Public Health, the report reveals that total abortions in Iowa continue to go down, while chemical abortions are on the rise. In 2016, 3,722 total abortions occurred in Iowa. The annual number of abortions in Iowa has fallen by 39 percent since 1999, the earliest year with data available, when 6,106 abortions occurred. Since 2015, when 3,989 abortions were performed in Iowa, abortion totals have dropped by seven percent. At the same time, chemical abortions are increasing. In 2004, the first year chemical abortion data was reported, 1,653 abortions were chemically induced. By 2016, total chemical abortions had risen by 36 percent from 2004 and by 3 percent from 2015 to 2,251 abortions. In 2016, most of Iowa’s abortions were chemical abortions, at 60 percent of the total. Iowa’s state abortion rate in 2016 was 6.3 abortions per 1,000 resident women ages 15 to 44, down slightly from the year before1. Eighty-five percent of the abortions occurring in Iowa were performed on state residents. The month of March had the greatest number of abortions, 380, while November had the fewest, 222. Iowa includes detailed information on the ages of women who seek abortions, reporting how many abortions were performed on women aged each year between and including 15 and 44, as well as the number of women whose ages fell outside that range. Eleven percent of women were age 19 or younger, 58 percent were in their twenties, 28 percent were in their thirties, and 3 percent were 40 or older. Seven abortions were performed on girls under the age of 15. The majority of women, 72 percent, were white. Fifteen percent were black. Many of the women who sought abortion were college-educated, with 60 percent having completed at least some college. Most women were unmarried (85 percent). Iowa reports gestational age by trimester, and the vast majority of abortions, 94 percent, occurred in the first trimester (up to 13 weeks gestation). Six percent occurred in the second trimester at 14 to 28 weeks gestation. No abortions were reported to have been performed during the third trimester. Iowa prohibits most abortions after 20 weeks post-fertilization or 22 weeks gestation, when babies can feel pain, although exceptions are permitted when the mother’s life or a significant bodily function is at risk. However, Iowa’s report does not specify how many abortions occurred at each week of gestation, which means that the number of abortions performed at or after 20 weeks due to an exception cannot be identified. For seven abortions, the gestational age was not reported. Iowa publishes detailed information on the spontaneous abortions, or miscarriages, that occur in the state. Many states do not report miscarriages, and often the states that do report this information provide only total numbers without more specific data. Iowa breaks down its miscarriage data by multiple characteristics, including date, gestational age, marital status, education level, race, maternal age, and location. In 2016, 538 miscarriages were reported in Iowa, an increase of ten percent from the year before. Unlike induced abortions, miscarriages occurred more frequently to married women and to women who had not attended college. By including miscarriage data alongside abortion data, Iowa provides for easy comparison of pregnancy outcomes and allows the calculation of a state pregnancy rate. However, Iowa could improve its reporting by including information on previous live births, abortions, and miscarriages to women seeking abortion. A study on state abortion reporting published by the Charlotte Lozier Institute in 2016 described Iowa as 33rd out of the 50 states, New York City, and the District of Columbia. Iowa could improve several aspects of its abortion reporting. Chemical abortion has an estimated failure rate of 4.5 to 7.9 percent, but Iowa does not collect or report information on abortion complications, even as chemical abortions make up 60 percent of all abortions in the state and continue to rise. Even though Iowa requires parental notification before minors may obtain abortions, unlike some other states, it does not report whether parents are being informed and whether minors are using the exceptions to the notification requirement. Iowa could also strengthen its miscarriage reporting by adding information about previous pregnancies, including miscarriages, experienced by the women who had an abortion. Additionally, a detailed breakdown of the gestational ages at which abortions are performed would allow for a more accurate count of the number of babies aborted after the 22-week gestational limit. By implementing a few improvements to its abortion reporting, Iowa could provide concerned citizens and researchers with a better understanding of abortion in the state. Iowa’s abortion reports demonstrate inconsistencies in the way the state abortion rate is reported, which make it difficult to track changes in the rate over the past several years. For example, the reports for 2014, 2015, and 2016 report two separate rates, one calculated using all abortions performed in the state and the other calculated using abortions performed on residents only. However, 2008 through 2013 do not report separate rates. The Iowa department of health confirmed that the two separate rates in the 2016 report are calculated using all abortions performed in the state and abortions performed on residents only, but did not address the inconsistencies in how the rates are reported. Abortion totals were taken from Table 4 in Iowa’s vital statistics reports for 2005 through 2016.